A surprised hotel guest who traveled from Canada to visit Disneyland suffered minor cuts and bruises when part of a rain-soaked ceiling fell on her overnight as a storm pounded Southern California. 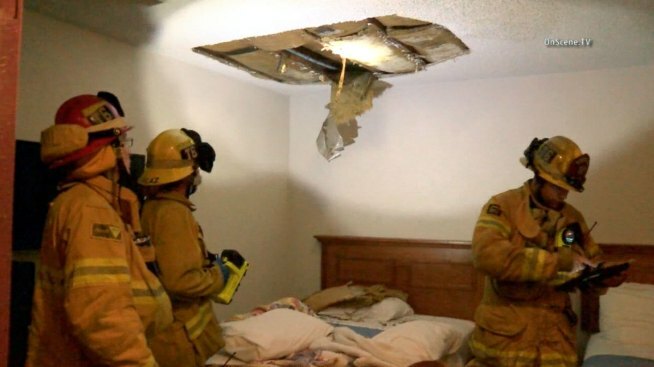 Saturated drywall above the hotel room bed broke apart at about 2 a.m. and fell onto the guest at the Alamo Inn & Suites in Anaheim, according to the Anaheim Fire Department. The woman, who traveled from Vancouver, Canada to visit Disneyland, was hospitalized with minor injuries to her chin and face. Paolo Ang, a friend of the woman, was sleeping in a next-door room when he heard the collapse. "It was a huge bang," Ang said. "It sounded like someone dropped onto the floor from the bed." 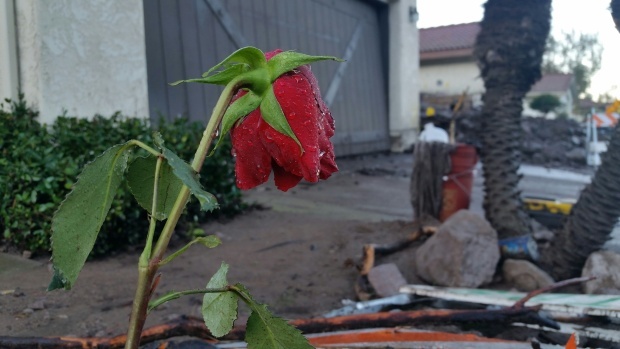 The ceiling was waterlogged after nearly two days of heavy rains that continued overnight in Southern California. The visitors still plan on stopping by Disneyland after their friend is released from the hospital, Ang said.